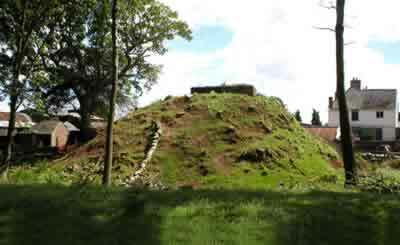 Newcastle is an early Norman earthwork motte and bailey fortress, which stands on high ground. Within a roughly D-shaped ditched enclosure, is a steep oval ditched motte and to the west defined by a ditch, with a counterscarp bank are the remains of a raised narrow crescentic bailey. A modern barn and water tank have damage the motte and most of the enclosure is built over. 2 miles north is Skenfrith Castle and 4 miles west is White Castle. Newcastle is located in the village centre, off the B4347. 5 miles north-west of Monmouth, on the B4233-B4347. The site is is visible from the road.